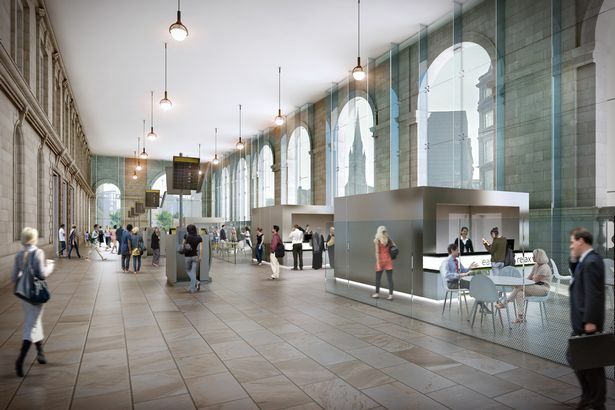 Newcastle’s Central Station is set for a radical £8m makeover. Rail chiefs are set to pedestrianise the taxi rank outside the station entrance as they prepare to create an impressive new entrance to the city. The entrance will be the centrepiece of £8.6m worth of work which will see the arches glazed over and the currently gloomy entrance turned into a traveller-friendly area. As part of this the walls of the station will be sandblasted and new lights fitted. Inside the main station the current ticket office will be reduced in size and the space handed over for shops, with booking facilities moving to a new site just past the Sainsburys shop. East Coast, which manages the station, says it wants to double the amount of space for shops and food stalls at the station as a result of the Department for Transport grant. It follows years of talk from business groups, council leaders and rail firms eager to turn the underused station into a more impressive “gateway” to the city. The changes, set to be in place by April 2014, will need planning consent for the Grade I listed building. Planners also want to see the car park space outside the Centurion pub pedestrianised. Taxies will still queue up from Orchard Street with a new pick up point made near the Station Hotel. Newcastle Council will itself spent more than £4m to improve the area immediately outside the station in the coming years. Metro bosses at Nexus were recently turned down in a bid to Government for a multi-million pound refurbishment of the Central Station Metro stop. The station improvement work is due to begin in May, and is expected to be completed in April next year. The station will operate as normal throughout the works.